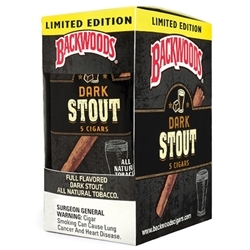 Backwoods Dark Stout Cigars, is a cigarillo style cigar wrapped in an all-natural Connecticut Broadleaf, fused together with 100% natural tobaccos. The Dark Stout is designed with a tapered body, unfinished head and frayed at the end. Each of these cigars brings the mode tone of a tavern setting, offering hardy flavors of roasted coffee with hints of rich dark cocoa.